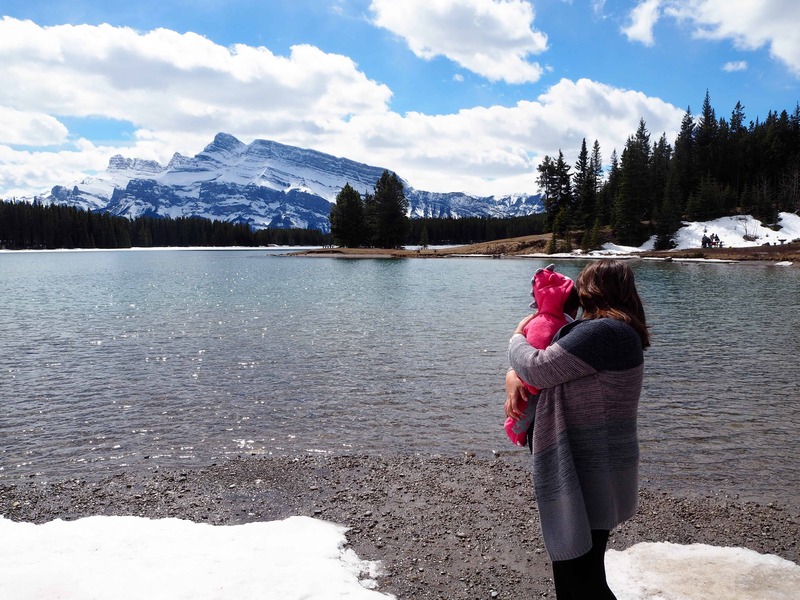 Banff National Park has to be one of the best places you can travel to with a baby, in fact Banff has to be one of the best places you can travel to full stop. 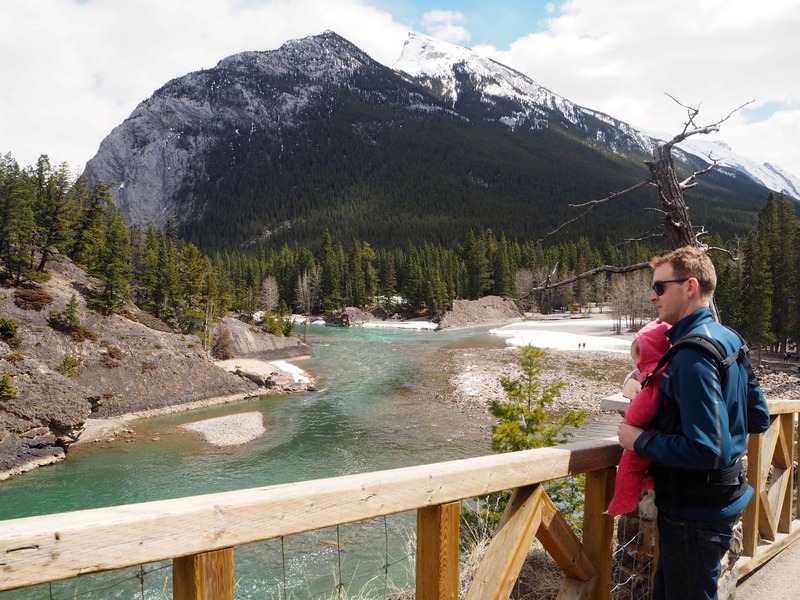 Jaw dropping vistas and landscapes, plenty of (nap inducing) walks and drives and great food (for us not the baby!) This was a completely different trip for us as a couple, not only was it our first big trip with Amelia but it was also a definite departure from our standard city break or scuba adventure. 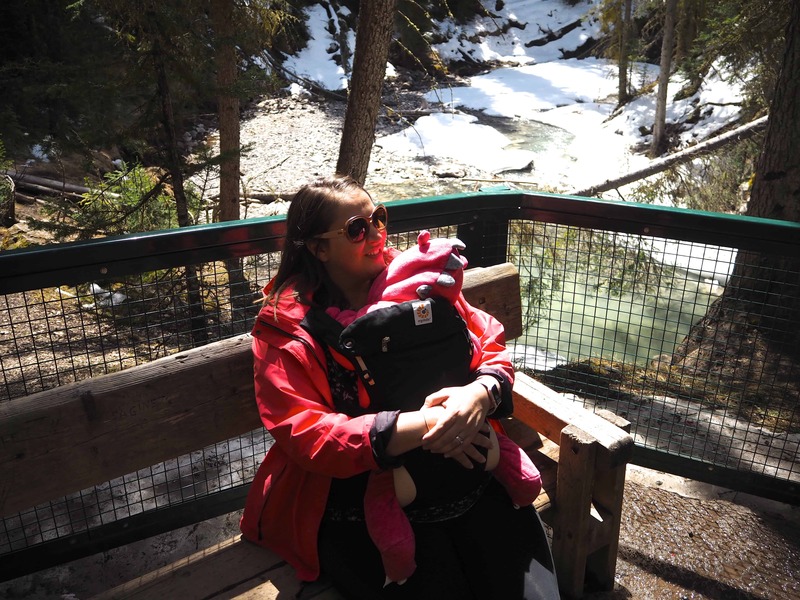 We hired a car for the duration of our Canada trip, taking advantage of a 4×4 and this made getting around so much easier and meant we were free to come and go as we desired, perfect when travelling with a baby. Stunning. Absolutely stunning. 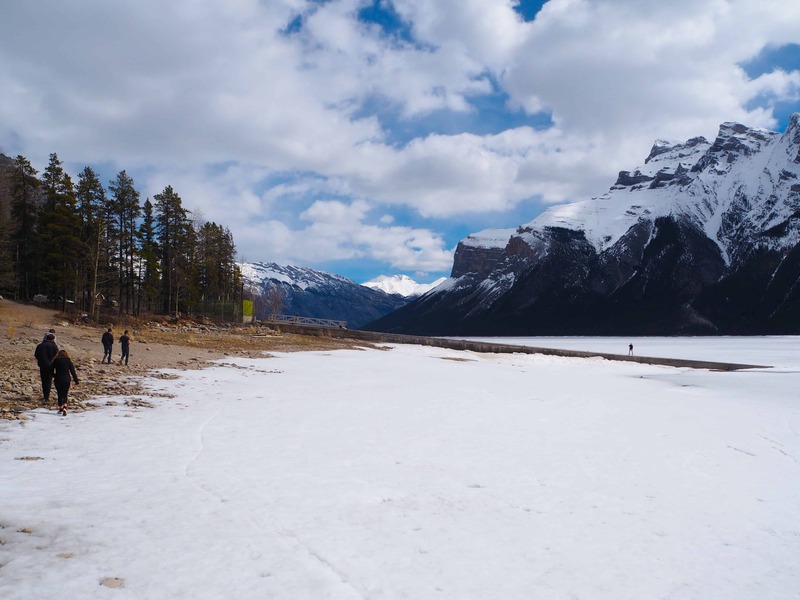 Even though we visited Minnewanka just before the lake had started to thaw, it’s beauty and scale were still incredibly impressive. I knew on first sight that I already wanted to come back to see the lake and surroundings during Summer. I can imagine seeing the lake in every season has something to offer. 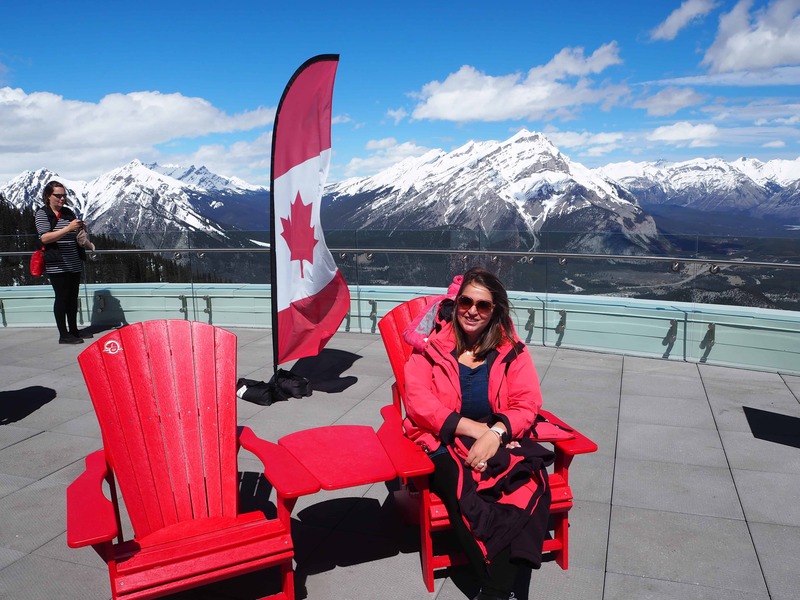 We thoroughly enjoyed our walks around the perimeter and sitting in the Canada 150 chairs that were dotted around in order to take in the view further. From Spring onward there is a boat cruise on the lake, however this doesn’t start until the lake is thawed out which dependent on how winter has been can be as late as the end of May. Even if you’re not feeling particularly adventurous, there is a car park located 5 minutes from the lake so really easy if you wanted to just hop out have a quick look around, snap some photos and then head back to the car. Be warned if you travel during the Bear season (more information here) that they are often sighted around this area so you need to make yourselves aware of how to be safe around bears and it may be a good idea to find out if any Bears have been sighted in the area recently before you head out if you’re particularly worried. The best source of up to date bear sighting information we found was the Banff Visitor Centre in the centre of Banff Town, they also provide great walking maps and other useful local information. 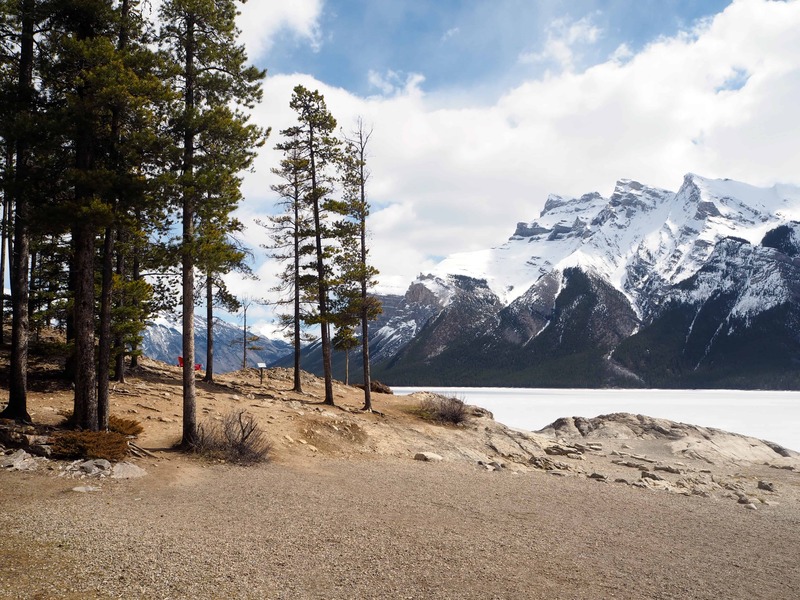 Easily combined with a trip to Minnewanka is a visit to Two Jack Lake which is just down the road or round the corner dependent on which way you are driving and part of the so called Minnewanka Loop. This is a really lovely place to have a longer leisurely stop and maybe get out your packed lunch if you’ve brought one. We had some snacks in the comfort of the car but I did see some intrepid travellers making use of the picnic tables down by the lake even though it was the end of April. There is also a campsite here which I imagine is an absolutely glorious spot to camp in Summer. 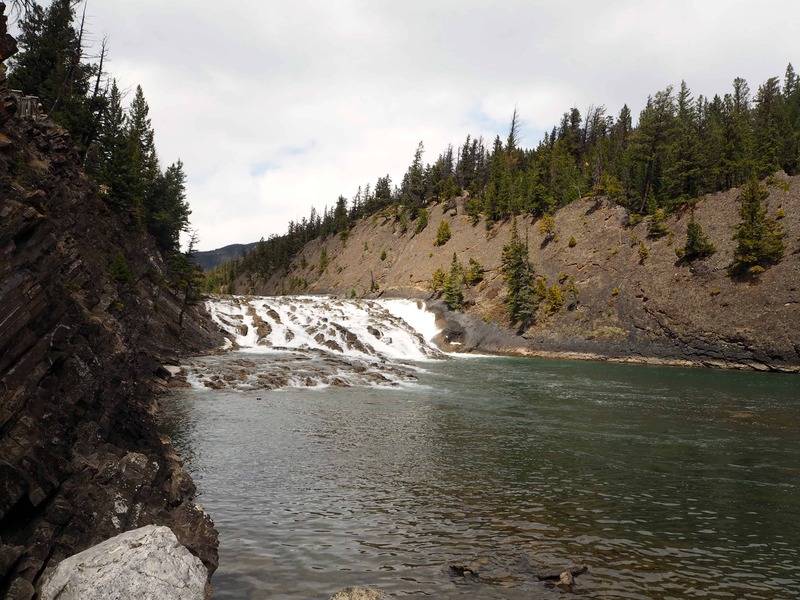 Ridiculously easy to get to from Downtown Banff on a lovely walking trail alongside the river is the impressive Bow Falls. 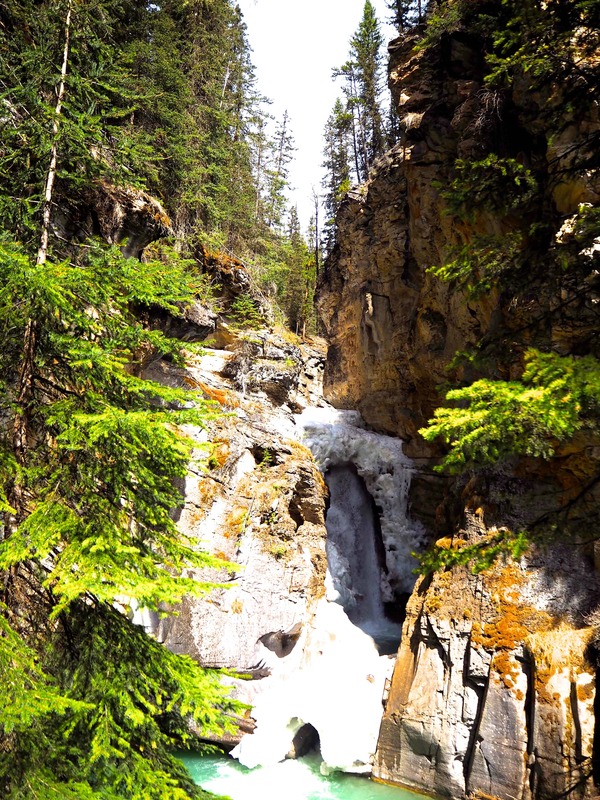 This could be the perfect warm up walk or hike for those not keen on walking but also offers incredible scenery along the way and the end sight of the Falls is worth it. 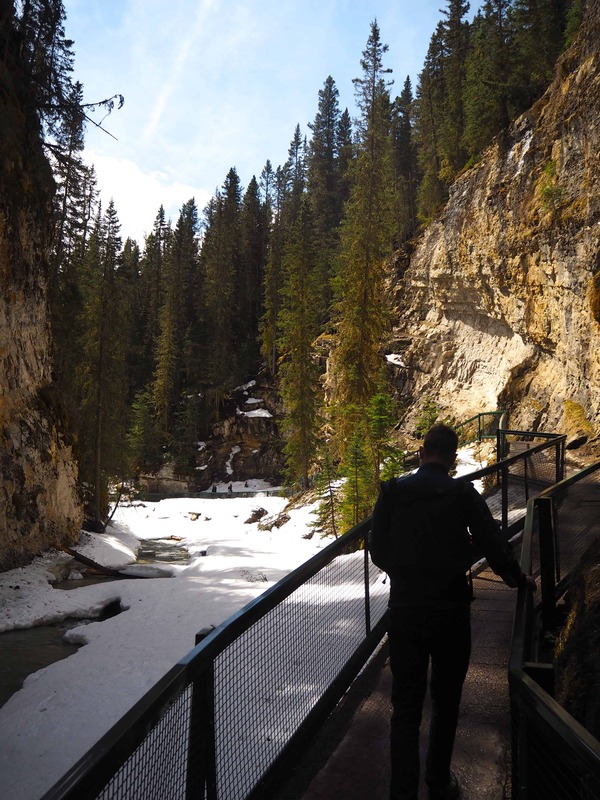 If the trail is open it’s also an easy walk up to Banff Fairmont Springs for a delicious hot chocolate, or walk carefully on the road if the trail isn’t open. Alternatively there is a large car park at the foot of the falls and you could do the walk in reverse and then return to pick up the car. Some great details on this walk can be found on this site, which has lots more details on similar and more challenging walks. One of a number of hot springs open to the public in the Alberta region, the Upper Hot Springs are a nice change from walking and taking in the sights. An ideal opportunity to give your bones and muscles a bit of a warming. The facilities aren’t luxurious but they are perfectly acceptable and it’s a great way to spend an hour. We even took Amelia in with us, although we only stayed for 30 minutes as any longer and she would have overheated as the water is quite toasty. The view from the pool is pretty great too so worth a stop on your Banff travels for sure. This could easily be combined with other activities in the same day and there’s no need to book so you can even make an ad-hoc visit when you feel like it. We didn’t hike around here as a lot of the area was closed off due to icy conditions on the trails however we did drive along the Tunnel Mountain road which was in itself a pretty and scenic drive. We stopped at a car park which happened to be the best vantage point for the HooDoos, which are sort of like naturally eroded funky rock ornaments. The view from up here is pretty special as you can see the whole of the Bow Valley. We did see people walking closer to the HooDoos and presume they must have had all the proper gear with them as I didn’t fancy it even in walking boots and definitely not with a baby. 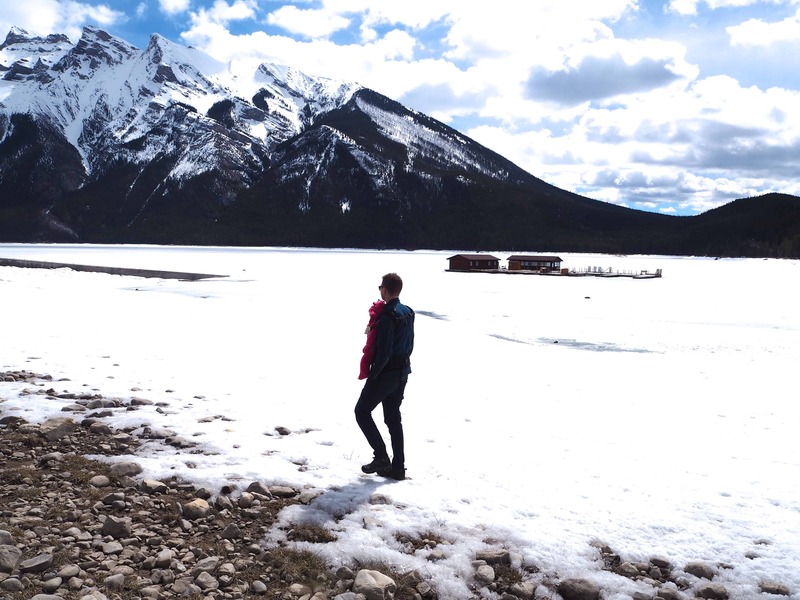 We were very lucky that our hotel was located with a great view of the three Vermillion Lakes anyway but we decided that for a slower afternoon we’d drive down and have a closer look at them. 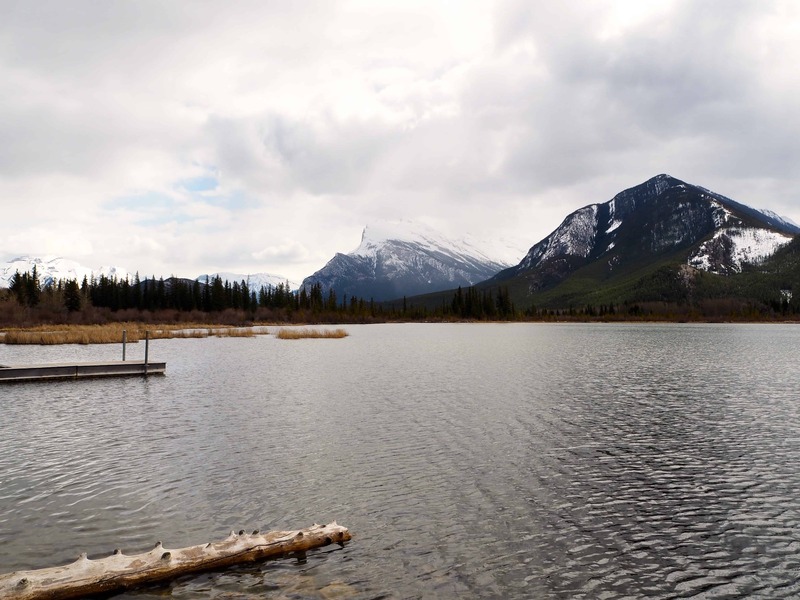 The lakes are not as impressive as some of the other lakes in the area but what they do bring to the table is the impressive backdrop of Mount Rundle. Apparently there is a bald eagle that makes the lakes its home every Spring however I think we were a bit early in the season to see him flying around. 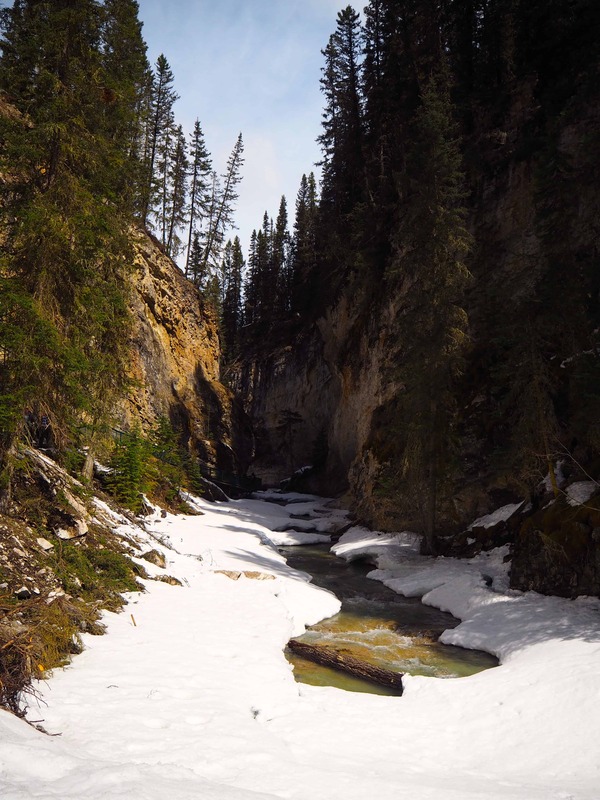 When speaking to all the locals about their favourite place in Banff National Park, Johnstone Canyon almost always ranked top of the list. 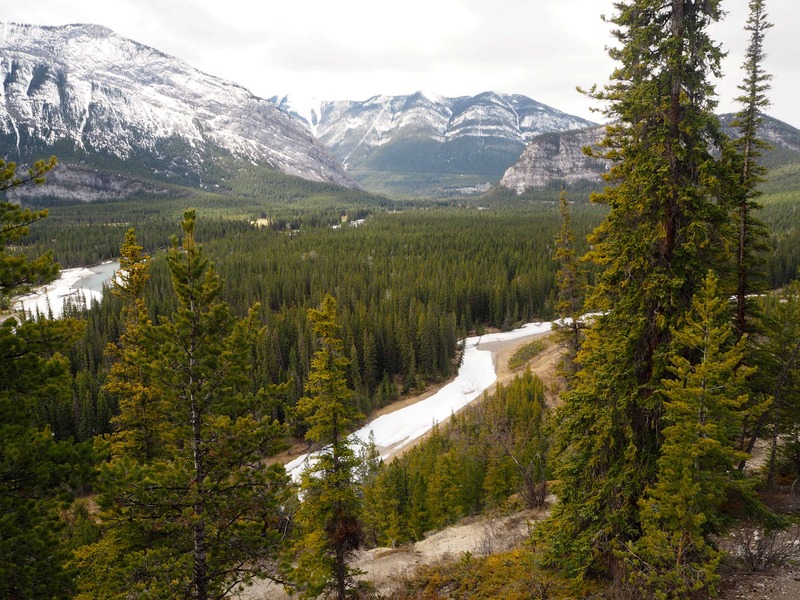 Getting there is also part of the excitement as you will need to drive along the 1A Banff Park Highway which is famous for wildlife sightings including Bears. We saw what we think was a young brown bear on the side of the road, it’s so important to follow the safety advice and not approach wildlife but aware them from a safe distance. We saw some crazy people actually come to within 50m of the bear to take a selfie! Johnstone Canyon has great facilities, including a car park, toilets and a restaurant/snack stop however the latter wasn’t open when we were there. There are two main hikes to do from the car park, one to the Lower Falls and one to the Upper Falls. 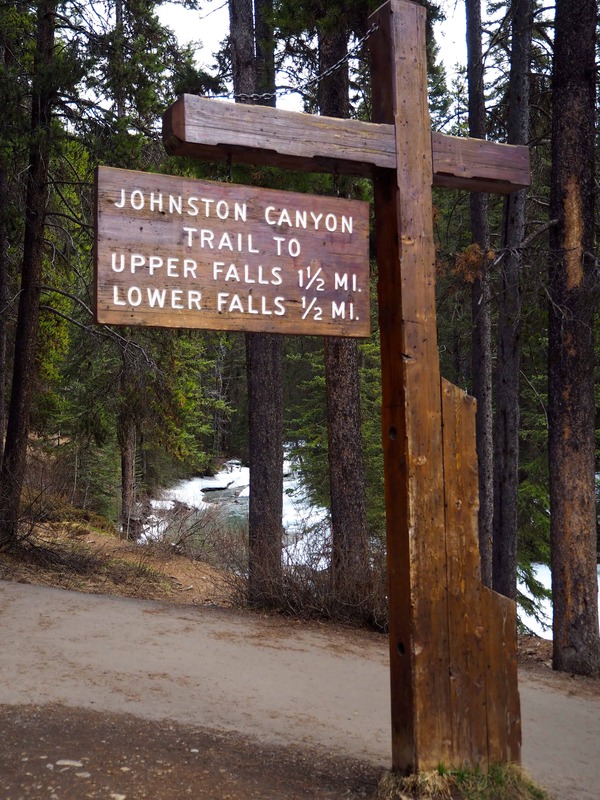 We were warned that the normal very easy hike to Lower Falls was actually quite tricky at this time of year due to ice on the trails that hadn’t thawed yet. The trail is in a Canyon so obviously not as open to a huge amount of sunlight, this meant for us the hike to the Upper Falls was out of bounds. The walk was pretty easy to follow from the car park, and yes the icy trail was a bit difficult in parts (mostly because one of us always had a baby strapped to us!) it was completely fine and well worth the effort as the surroundings were beautiful. At the lower falls you can actually climb into the canyon for a closer look at the waterfall which is pretty impressive too and there was lovely spot to sit and have a rest with a snoozy baby. 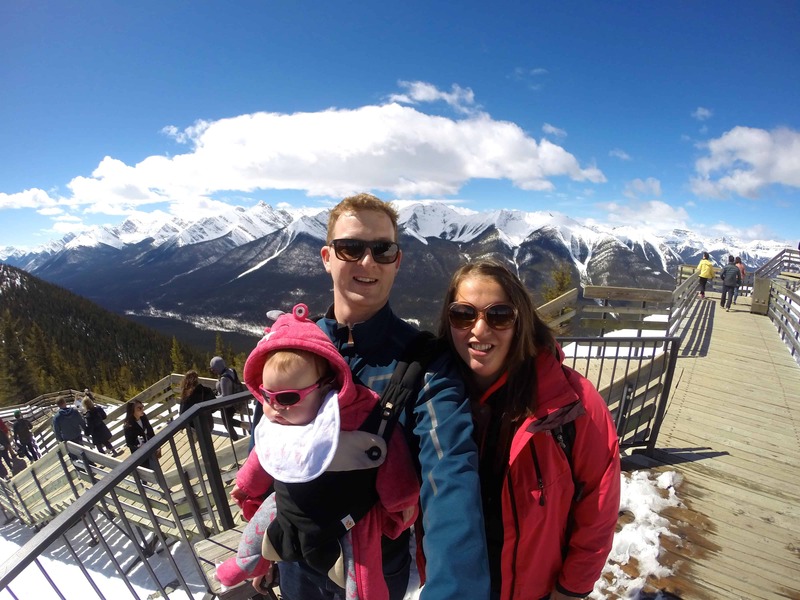 Who wouldn’t want to take in the impressive panoramic views of the Rockies from the top of Sulphur Mountain? Me. I hate cable cars, gondolas, ski-lifts and generally anything where I am suspended in mid-air (I am fine with flying and heights in general though) however I knew that the pay off for 7 minutes in a Gondola would be immense so I had to do it. I am very glad I did, as you can see from the photos, the view is breathtaking from the top and once up there surprisingly loads to do! 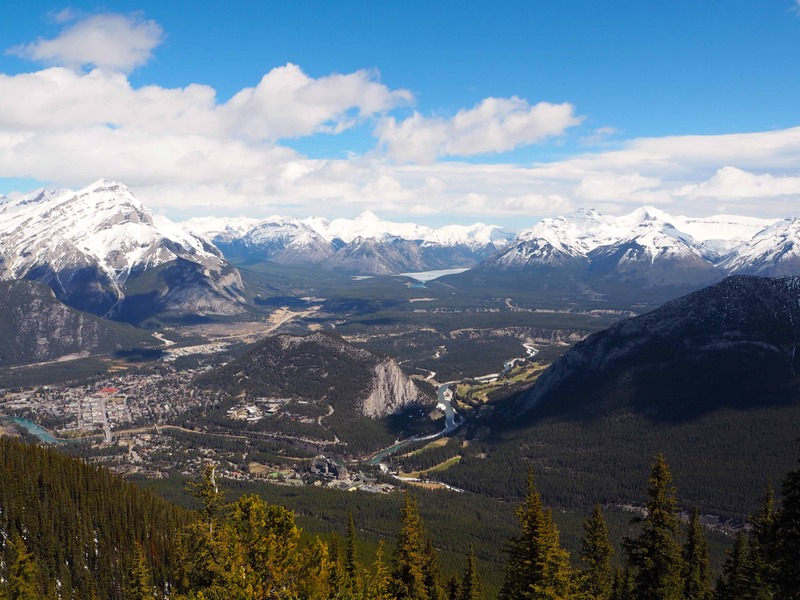 There’s a restaurant, cafe, museum and of course trail paths taking you right to the summit of Sulphur Mountain. Even in Spring or Summer I would suggest taking extra layers up with you as it’s a good few degrees colder than it is on the ground. 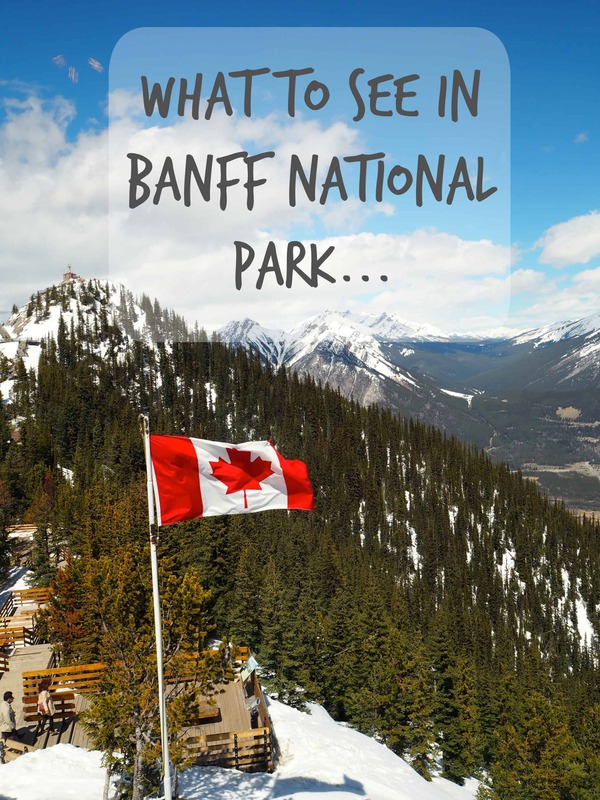 Tickets can be purchased in advanced as well as part of a package encompassing other Banff Sights or on the day like we did enabling us to go when we knew the weather would be clear and fine. 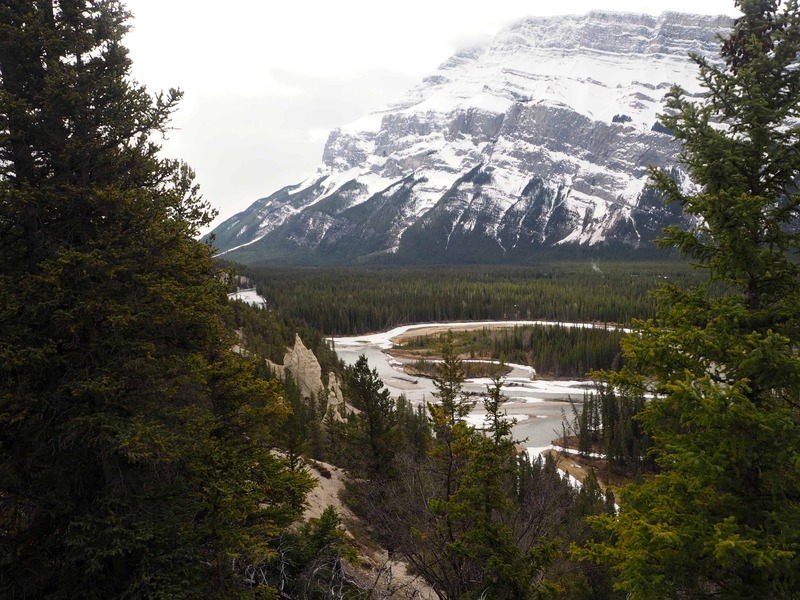 The one sight that is synonymous with Banff and one that I must admit had drawn me to wanting to travel to the National Park in the first place. 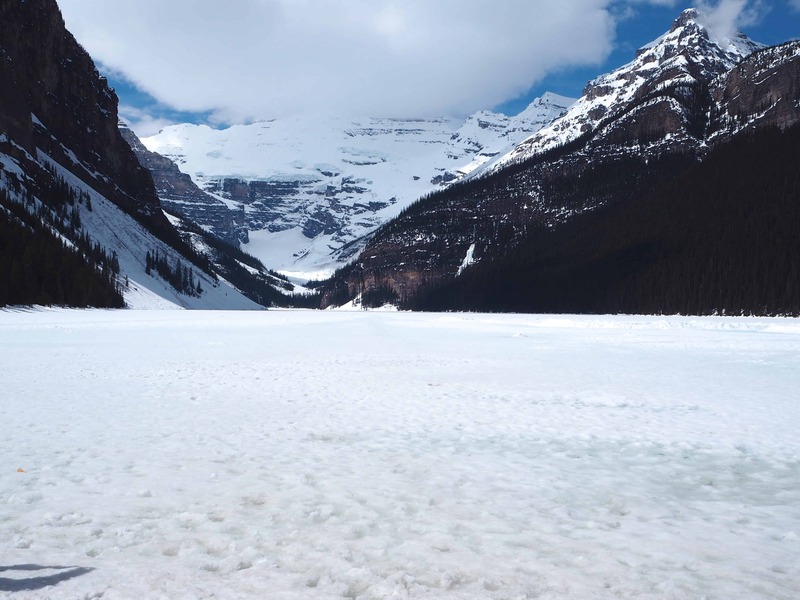 The Lake had not thawed by the time we arrived in May and it doesn’t turn that beautiful shade of blue until July and August but never the less it was still impressive and as if on request started to snow once we arrived. 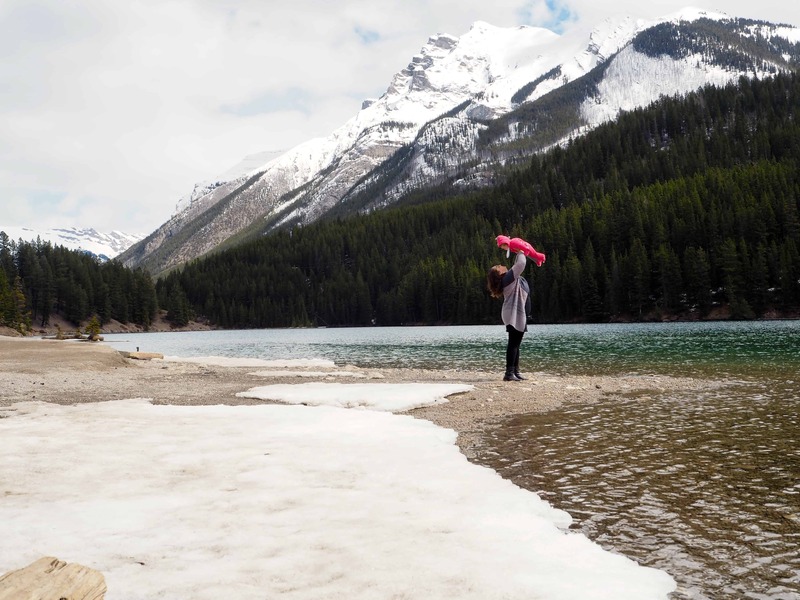 There are many trails around the Lake, the most famous being the hike up to the Plain of Six Glaciers Teahouse and the Lake Agnes Teahouse, however both were deemed too risky for us with a baby and the icy conditions. 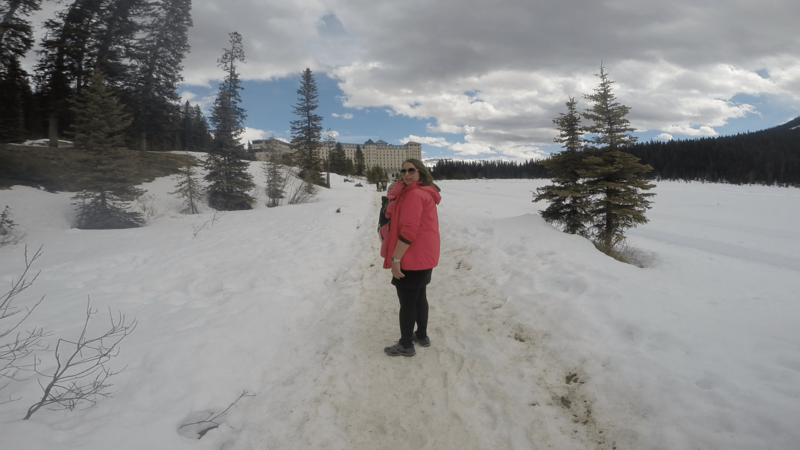 Not to worry though as the Lake was still covered in ice we were able to actually walk on Lake Louise and around it, due to the higher elevation here it was likely to still covered in ice into June as we were told by the staff of the Fairmont Chateau Lake Louise. The hotel is a destination in itself, we enjoyed a fantastic lunch in the Lakeview Lounge and were thoroughly looked after by the staff. Banff Avenue isn’t to everyone’s taste as it does have a lot of tourist shops but it’s also home to great restaurants, cafes and outdoor gear shops so I feel something for everyone. 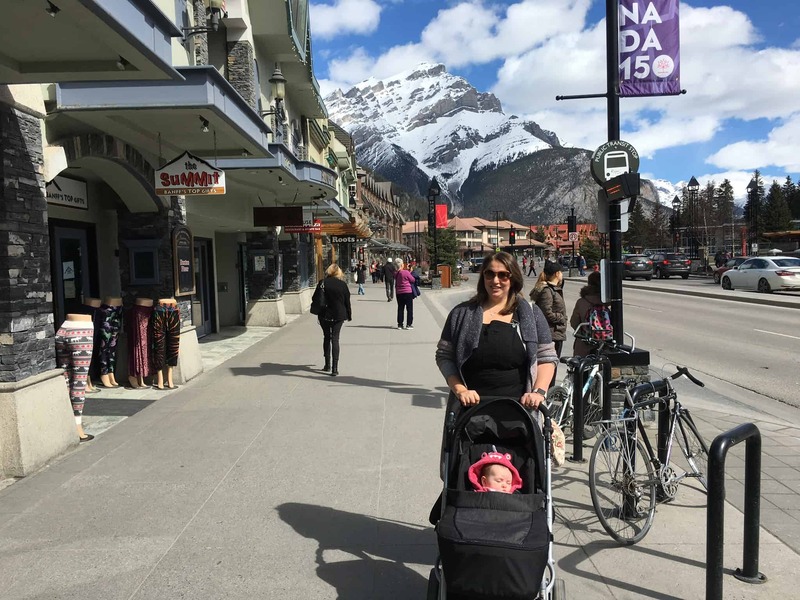 We’d end up on Banff Avenue at some point every day, whether for Breakfast, Lunch or Dinner or to pick up snack supplies for our little jaunts around the area. I actually really enjoyed wandering around, popping in the different shops and chatting to the staff. We were probably quite lucky as it wasn’t too busy during the time we were there so were able to be served and seated most places very quickly however I am sure come July and August it is absolutely heaving and not the best place to saunter around like we did. On one of our saunters we happened upon the restaurant Park, lured in by their promise of gin and an amazing menu (more on that in another post) we discovered they actually had a distillery on site and offered tours. Being the massive fans of gin that we are, we checked we could bring Baby in tow, (yes is the answer) and signed up for 2pm tour. The distillery is compact but makes use of it’s space, and the guide was very informative of the different processes required to make gin. As a teacher I particularly enjoyed the little quiz at the end to check how much we had learnt! Of course the trying of the gin is always a winning end and the Park’s own brand gin didn’t disappoint. So if you fancy doing something a little different in Banff and have an hour to kill then get yourselves booked in. A cheeky final addition as the Icefields Parkway links both Banff National Park and Jasper National Park so should appear in both lists. However as seen as it encompasses so many of it’s own wonders and things to do I’ve dedicated a whole post to this amazing stretch of road so you can add it your bucket list too.